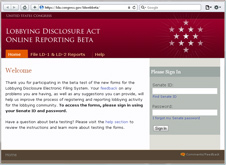 There are newer web based versions of the lobbying disclosure forms available for use on all of your future filings. These new Online Lobbying Disclosure forms have been available for over three years now and will be replacing the IBM forms early next year. We encourage you to start using these forms as we will not be accepting IBM forms after the 2014 Fourth Quarter filing period (ending January 20th, 2015). If you are an active registrant, you can download IBM Workplace forms that are pre-populated with your registrant and client information. To locate your forms, enter your registrant name in the field below and click the "Search" button. If you are not sure of the Registrant name, you can view the list of active registrant names in alphabetical order using the links below. If you have just registered a new client and a link to the pre-populated form is not available, please check the download page again later in the day. The icon will be displayed when the new form is available. MADISON LAW & POLICY, P.C. Magna Services of America Inc.
MEHLMAN CASTAGNETTI ROSEN & THOMAS, INC.
Missile Defense Advocacy Alliance, Inc.
Click on the link below to download blank semiannual LD2 forms. The IBM Workplace Viewer software is required to work with the Lobbying Disclosure forms on a Windows computer. To download the application, enter your registrant name and e-mail address in the fields listed below and click the "download" button.